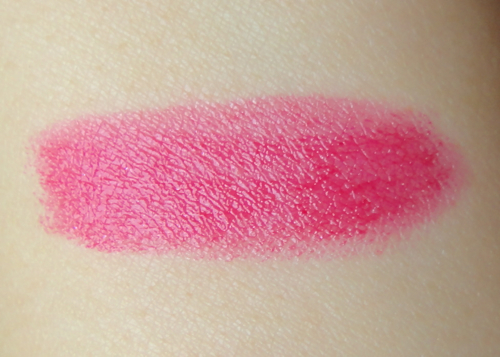 I actually received Manna Kadar Lipstick Saucy in the Wantable PR box last year, and it was my favorite from the box. I immediately thought this lipstick was excellent both in color and wear, but kinda forgot about it until recently. Saucy is a saturated fuchsia pink with glossy finish, and quite a gorgeous and unique one. "Sheer Fuchsia Blue Pink" is the simplest description from the website, which doesn't do a justice for this pretty color. 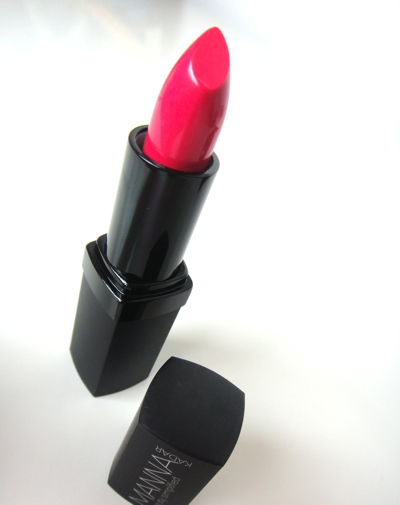 It is housed in a simple matte black tube and the lipstick bullet looks rather traditional. The mild vanilla scent is just like the one from MAC lipsticks and the formula reminds me of MAC Lustre lipstick if not better. In fact, I think Manna Kadar lipstick feels lighter and the moisturizing effect is longer lasting. This lip hugging formula applies very evenly and also fades away naturally. The color is very vivid yet sheer with buildable coverage, and it lasts on me for about 4 hours. Saucy is definitely blue based but also has a nice dose of red in it. There is shimmer but it hardly translates on lips. See how evenly the color faded without leaving any dry patches? I have been sporting Manna Kardar Saucy quite often this month simply pairing it with some eyeliner and mascara. As bright as it is, Saucy is very wearable thanks to its complexity and superb formula. The price point is somewhere in the mid-high range ($21), which I don't see as competitive cause MAC lipstick is $16 a piece with much wider color offering, for example. The exterior doesn't look as attractive as some of the higher-end choices, either. However, I can really vouch for the formula and the color Saucy, and I would remain interested in trying more lipsticks or other things from the brand. Have you tried Manna Kadar Lipsticks? What is your favorite hot pink shade for spring? Hot pink lipsticks are so in for the season. Hope you find something nice for yourself! Now this is a yummy shade and it looks really nice on you! I never heard about this brand but I really dig that colour! Oh this is really pretty! I've never heard of this brand before! I'm going to have to look for it! Wow, such a lovely blue based pink! When it comes to bold lip shades I'm a huge fan of fuchsias and I would jump for this shade! I've never heard of the brand before but I'd probably fall in love with this too! I didn't know about this brand, either! This is gorgeous!! I love the color. It definitely looks wearable, and I feel like it would brighten up my day. For a second I thought this was a Lancome lipstick - just the design of the tube and the intensity of the pigmentation - they stood out so much to me! It looks great on you :) I'm just starting to crack out more pinks in my arsenal though a lighter shade at a time :) Can't wait to rock a blue-based pink like the one you're wearing! For me, the tube is more like NARS but the lipstick scent reminds me of MAC. The quality is better than MAC generally speaking. I can't get enough of pink lippies and truth is I have too many. LOL. What a gorgeous color! I've been loving bright shades lately. wow it is such a gorgeous fuchsia!! it looks even better when it's faded imo! I love that the lipstick stays on and fades away so nicely that I don't have to worry about it too much although the color is quite bright! I haven't heard of this brand before... but gurl, you rock red lips!! It is new to me as well. Stunning, Lena! STUNNING. I don't know if I can wear this kind of pink with red hair now, though, lol! Oh I like that color! That's a great spring shade that I think would flatter a lot of people. Lovely! I'm happy this fuchsia isn't one of those plastic-y fake color that doesn't harmonize with skin tones. Love the color. It's perfect for coming summer. Wow the color after some hours looks beautiful and perfect, this is a Pro Lipstick! that dry down looks pretty good! lots of color left w/o parched lips. the matte tube sort of reminds me of the Nars lipsticks. I'm so glad this color fades very nicely. 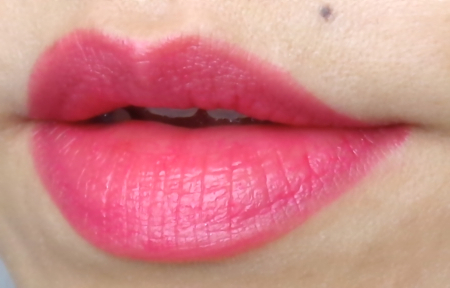 Like you said, the parched lips is the biggest problem with so many lipsticks. Love the colour and how it looks against your skin tone! Never heard of the brand but nice to know there are ever so many more options to consider, lol. I like that it is a good alternative for red as well. I haven't heard of this brand, but the colour looks amazing! So bright and intense! It was new to me, too!